The Accounts Receivable industry is becoming more competitive. Businesses need to partner with a payment vendor that does more than just take a payment. Adding a payment processing platform that offers built-in compliance can lighten your staff’s work load. PDCflow is a payment hub that creates a user-friendly consumer experience. The hub design makes it easy to facilitate inbound payments and reduces the time and energy your staff spends following compliance regulations. 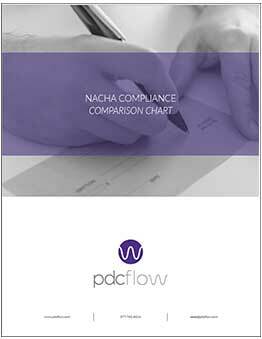 For more information on how to accept ACH payments with the PDCflow Payment Hub, see Accept ACH Payments.